Wandering China | An East/West pulse of China's fourth rise from down under. An East/West pulse of China's fourth rise from down under. Tucked away in a secondary road in Balestier is the former Sun Yat Sen Villa. Just over a hundred years ago, it was the Southeast Asian (Nanyang) headquarters for Sun Yat Sen’s revolutionary activities with the Tong Meng Hui secret society. The funds and support he raised here with the Tong Meng Hui had a role to play in the overthrow of the Qing Dynasty – marking the end of millennia of dynastic rule in China with the Xinhai Revolution in 1911. The Republic of China was established, Asia’s first. It had a western style parliamentary system although that didn’t last long. Few Singaporeans, nor northern mainland Chinese know about the existence of this place which in our minds, a glaring blindspot. First, it makes for a worthwhile visit to understand that Singapore’s relationship with China goes back a longer way than Deng-Lee relations, or the post-LEE post-Terrex new normal. Second, that Singapore had a hand in the birth of modern China. Sun Yat Sen visited Singapore nine times between 1900 and 1911. The villa was gazetted as a national monument in October 1994 and is now known as the Sun Yat Sen Nanyang Memorial Hall. I recently spent 10 days in China’s Guangxi Autonomus Region as well as Hunan Province. Whilst I have travelled to China many times before, this is the first time I’ve visited with an eye in the sky – a flying camera. Here are some aerial panoramas of my travels there. The first two panos below are of Guilin’s Karst-filled horizons. The bottom two are villages where China’s ethnic minorities are largely, self-determining. Each travel to China reminds me that China is not a monolithic entity. And that their population of close to 1.4 billion means 1.4 billion stories and agendas, all pretty much on the same roller coaster ride emerging from a century of mistakes they’re not keen to repeat. In this part of China there are hardly any heavy industries and the sheer number of domestic tourists I met suggests to me again a blindspot the rest of the world is not privy to. China’s domestic market is enormous. A step back to move forward. Hello again! Dear reader, it’s been a number of years but I’m back. I’ve taken time off to work on my book on China’s rise and it seems timely that I return to the blogosphere to continue sharing my thoughts now that the book’s probably a year away from completion. I was in Guilin with a flying camera in the Guangxi Automous Region recently. The objective was twofold – to get an updated first hand impression of what China’s periphery has been thinking about and doing, and second to document China from the sky. I returned with a number of aerial photos and look forward to sharing them here. Greetings readers, the Wandering China blog will be taking an intermission till further notice. I thank you for your kind support. Greetings readers *especially if you are from/based-in Singapore – if you have a few moments to spare, I appreciate your input for an online survey. Your inputs are deeply appreciated as it will provide important data for this twenty-first century update of modern Singapore’s response to China’s rise. Research Objective in a nutshell: To study the impact of online media / web 2.0 on how people in Singapore form opinions about China’s rise. This survey should take about 15-20 minutes to complete. There are 38 questions in total, the majority of which are either multiple choice or based on a rating scale. Inputs will be collected and analyzed after the questionnaire closes on [June 15, 2014]. Responses are collected anonymously and will used solely for research purposes. 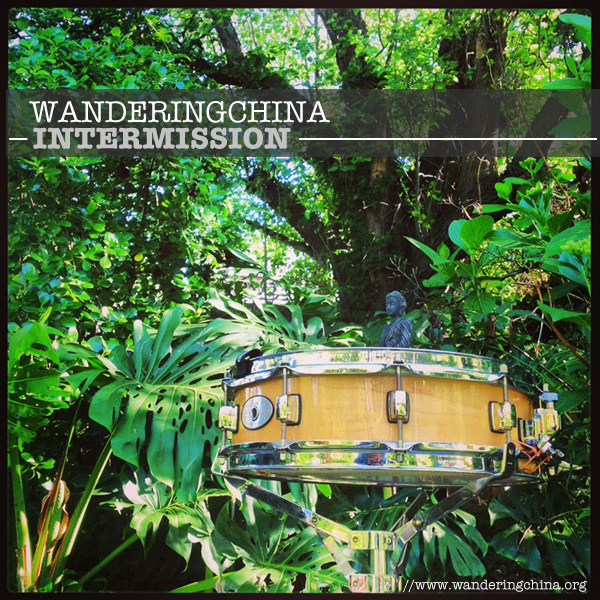 Please bear with this intermission as wanderingchina re-formats for 2014. A new format is on the way – the aim is to cast a wider net of media coverage – per post. 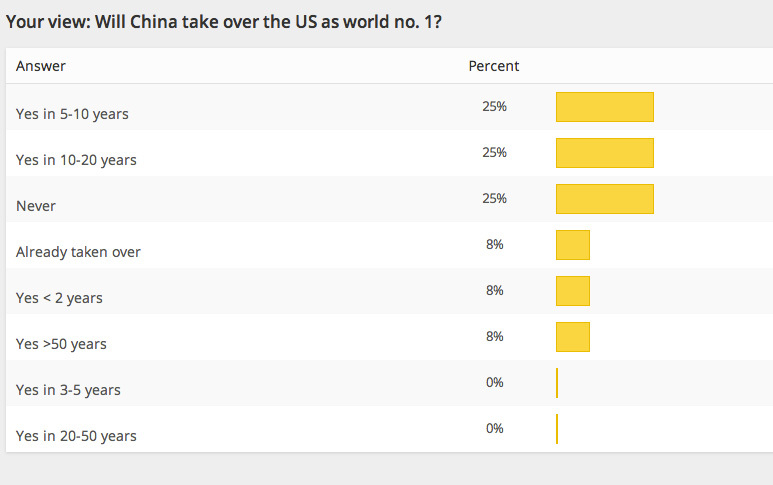 In the meantime, here’s a look at the results of the past two online polls. Flooding headspace to gain consensus. China doesn’t just exert heavy control over state media; its influence over media outlets outside China is expanding, according to a new report by Freedom House. For the past three years, the government has been investing millions of dollars in a global soft-power push. State newspaper China Daily publishes inserts of its English edition in major Western papers from the Washington Post to the New York Times. China’s Central Television, or CCTV, has hired dozens of experienced reporters from the US for its Washington bureau and rivals other foreign operations like Al-Jazeera America. According to the report, China is also doing things like offering free editorial content to Latin American, African and Asian news organizations that can’t afford to send correspondents to China. It’s also subtly exerting influence over Chinese-language media in Taiwan, Hong Kong, and Chinese diaspora communities. China has donated aid money, for example, to state-run media in Africa and Latin America and flown their journalists to China for training. Left-leaning countries like Bolivia and Venezuela have also bought communications satellites (pdf, p. 20) from China. In Southeast Asia, governments with close diplomatic ties to Beijing, like Vietnam and Cambodia, appear to be pressuring their media to let up on criticism of China. Please click here to read the entire article at Quartz. Filed under: Beijing Consensus, Charm Offensive, China Dream, Chinese Model, Communications, Culture, Education, Entertainment, Government & Policy, Ideology, Influence, International Relations, Mapping Feelings, Media, Modernisation, Peaceful Development, Public Diplomacy, Reform, Strategy, Tao Guang Yang Hui (韬光养晦), The Chinese Identity, The construction of Chinese and Non-Chinese identities, U.S.
Kneejerks to Xinhua Op-Ed that does not represent broader Chinese views. But what much of the coverage failed to mention is that the article appeared on Xinhua with the byline Liu Chang, indicating that the editorial more likely represents the views of Liu (who is identified simply as a “Xinhua writer”) and his colleagues rather than China’s top leaders, or “China” itself. Please click here to read the entire article at Foreign Policy. Of late, my efforts have been fully diverted to working on getting a solid block of writing out for the dissertation . I apologise for the intermission. Wandering China will be back fully running back 15 October. In the meantime, the Twitter feed will remain alive and kicking! Be a champ - Support Wandering China - buy a Tee Shirt! Slideshow reflection on Deng Xiaoping's UN General Assembly speech in 1974. Based on photos of my travels in China 2011. A collaboration with my brother: Comparing East Asia's rural and urban landscapes through time-lapse photography. Wandering China by Bob Tan is licensed under a Creative Commons Attribution-NonCommercial-ShareAlike 3.0 Unported License.